Ayanda Clarke (L) and Neil Clarke at the traditional chieftaincy ceremony in Osogbo, Nigeria (August 2016). They are the first American-born father and son to be installed as Chiefs in this ancient West African City. 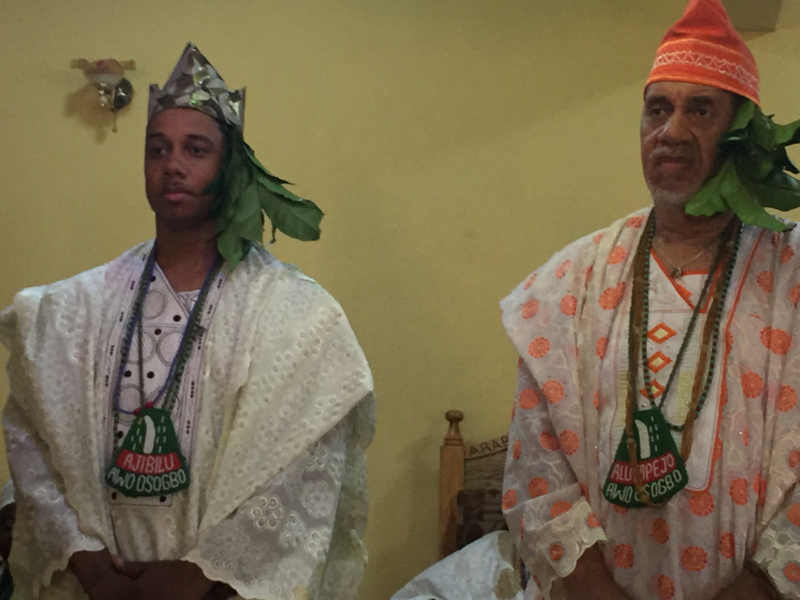 The Spirit of the Drum Continues: American-Born Father and Son Installed as Chiefs in Nigeria…A First! In the world of African music, there are few American-born percussionists who have mastered traditional drumming in the way that Neil Clarke has. Born in Bedford-Stuyvesant, Brooklyn in 1951, Clarke is highly regarded as a world class musician. 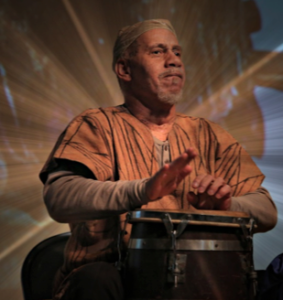 He has been involved with traditional African drumming and the percussive arts for more than half a century and has made it his mission to continue the pioneering work of his mentors and trainers. It’s noteworthy that those collective of elders played a pivotal role in bringing African cultural traditions to North America, South America, and the Caribbean in the late 1950’s and early 1960’s. To many students and peers alike, Clarke is a living legend. The accolade didn’t emerge over the years simply because he has studied and performed with giants whose artistic mastery helped shaped his own career – giants like “Chief” James Hawthorne Bey and Baba Ishangi – but because of his own impressive accomplishments. Clarke, for instance, has performed on almost every continent, in too many countries to name, and has a discography totaling more than a hundred African-influenced recordings. World renowned artists such as Miriam Makeba and Letta Mbulu (from South Africa), and currently Jazz Master Randy Weston (from Brooklyn) are just a few who have invited Neil Clarke to work or tour with them for extended periods of time. Notably, Clarke had the honor of serving as the resident percussionist for Mr. Harry Belafonte for nearly 15 years. Beyond his musical skills, Clarke is a meticulous researcher on African culture and on the significance of the drum, in particular. When it comes to the percussive arts and the variety of African cultural expressions around the globe, few musicians or scholars have endeavored to make the bold case that Neil has made regarding the relevance and merit of the African drum. His scholarship, research, and most importantly his practical experience is unmatched. He is loved as a dynamic and passionate educator and has created artist residencies and programs for all educational levels, from elementary school to higher education. He has taught master classes at Harvard University, Duke University, Rutgers University, and many other institutions across the United States and internationally. Regionally and nationally, his engaging lectures and drum workshops serve to inspire and educate those who may have thought that the instrument was merely a noise-maker, something to bang on. All of these achievements combined have helped clear a path for Clarke’s latest accolade from last month. It’s not a stretch to say that Clarke’s latest journey is the achievement of a lifetime. 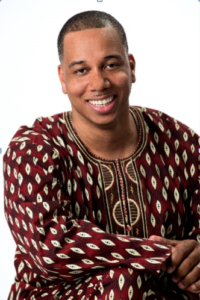 Not long after this drummer was honored with the Jazz Impact award from the Central Brooklyn Jazz Consortium (CBJC) this spring, Neil Clarke made a historic trip to Nigeria (which was not his first time to this West African country). In August, Clarke was installed as a chief in Osogbo, the capital city of Osun State. The highest ranking priests conferred the chieftaincy title upon Clarke in a day long ceremony that was attended by a welcoming group of children, youth, adults, and seniors. Clarke is now Chief Baba Neil Clarke, Alufopejo Awo of Osogbo. There, his long list of accomplishments as a master percussionist were read to the community, first in Yoruba and then in English. His long-standing dedication to the people of Osogbo, and to African people-at-large, was highlighted throughout the program. It was clear that his chieftaincy was birthed from his untiring commitment to promoting African cultural aesthetics. He is now charged with continuing his work but on a higher level. That could mean more frequent drum lectures and workshops; more productions and historic re-enactments such as The Pinkster Festival; and/or more from the Neil Clarke Trio Plus ensemble. One of the highest ranking priests at the ceremony made a keen observation about the historic event. He informed the audience that, in a sense, Baba Neil (as he is affectionately known) was being honored twice on that day, for his eldest child, Ayanda Clarke, received a chieftaincy title as well. Like both his parents, Ayanda’s life reflects a full embrace of traditional African culture. But for Ayanda, a GRAMMY® Award winning master percussionist, this journey has been a bit atypical. He was born and raised in Bed-Stuy and went on to graduate from The Dalton School on the Upper East Side of Manhattan and later from Wesleyan University in Connecticut (with a degree in ethnomusicology). While thriving in multi-racial environments during his formative years, Ayanda always identified proudly as an African. Effortlessly, this prodigious-child-turned-chief maintains these values in all aspects of his life. And after 35 years of study, training, and performing around the world, he has emerged as one of the most outstanding percussionists of his generation, according to his peers and elders. Ayanda is now Ajibilu Awo of Osogbo, Chief Ayanda Ifadara Clarke. After the ceremony in Osogbo, there was a joyful procession in the streets where the new chiefs walked amongst the established chiefs as the drummers kept everything festive. That was followed by a high energy celebration at the compound of Chief Fakayode Faniyi, Agbongbon Awo of Osogbo. Well-wishers of all ages sang, danced, and praised the new chiefs well into the night. Perhaps the greatest significance here is in how powerfully these chieftaincies demonstrate the unity and sacred bond among people of African ancestry. Hosted by High Priest Ifayemi Elebuibon, Araba Awo of Osogbo, at his palace, the honors also set a precedent. Never before have American-born father and son percussionists been installed as chiefs in Osogbo. And Osogbo, Nigeria is an ideal place for all this to have occurred. This ancient city hosts the annual celebration of the Osun Festival at the sacred Osun Grove. It is this grove, because of its centuries-old history, that was designated as an UNESCO (United Nations Educational, Scientific, and Cultural Organization) World Heritage site in 2005. It is this city where indigenous African art and tradition are highly revered and protected. 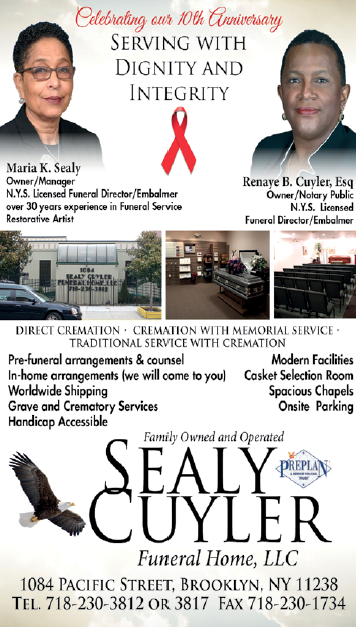 It is this sacred place that the Clarke family will continue to honor and support, all in appreciation for its significant role in our ancestral and cultural linage.